Pope Brothers joined the movement of more substantial structures on the south side of East Fourth Avenue when they built their new hardware store in 1906. They chose concrete block as the primary building material. It appears that the block used was produced by the Finkenbinder & Studebaker Cement Works, possibly under the umbrella of Platt & Frees Lumberyard. The location chosen was that formerly occupied by Polnicky Saloon’s frame structure. It had been torn down shortly after he vacated it to build a brick structure of his own. The Pope brothers’ retail days on the streets of Red Cloud date back to 1883 when they first established themselves in the agricultural implement business. A 1901 newspaper article shows them as dealers for Milwaukee harvestors and Racine buggies and wagons. 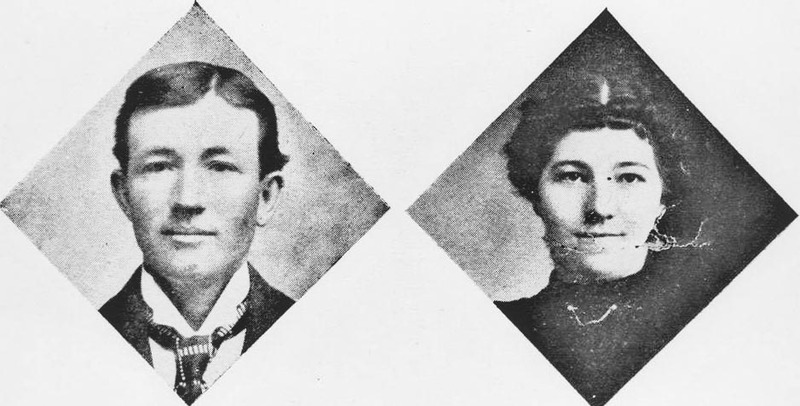 It was from the firm’s former location in the Potter Building that in 1904 Frank Barker purchased the gun he used to murder his brother and sister-in-law, Dan and Alice Barker. MOTIVE: If Dan and Alice were gone he and his fiancé would have somewhere to live once they married. In later years this building was home to various liquor stores.